I’ve just begun crewing “The Man Who Came To Dinner” and through sitting there for six hours while they set cues, a lot of things were revealed to me. I’ve realized what frustrates me so much about tech rehearsals. Don’t get me wrong, I like doing the whole crew thing, its just the actual “teching” that”s always really frustrated me and for some reason; about 3 hours in I was always ready to leave. It was the darkness backstage. Now somebody reading this is probably thinking, “What? Is he afraid of darkness?” No it isn’t that. It’s the fact that after about three hours of sitting in the darkness not being to hear the whispers that my fellow crew members are saying to each other, and the fact that I can’t read lips back there really sets you back. Especially if you feel they may or may not be talking about or to you. It’s also the fact that the stage manager gives orders through a microphone. This drives me crazy. I know, that’s how it’s done, it’s a “God Mic” and she has to use it. But that sound reverberates like no other. I can’t understand a thing and it drives me absolutely crazy. I made a complete idiot out of myself yesterday because I thought I heard something and did something else and it was very embarrassing. Nobody will offer to tell me what she said, so I’ve gotta improvise. It’s because of all of this, that I am constantly asking questions. And because I ask so many questions, I’m getting on peoples nerves and they start being impertinent towards me. I have NO IDEA what is going on. I can’t hear a thing back there and my vision is impaired. 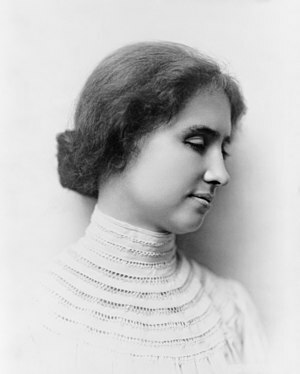 Yes, as many of you are thinking, truly a Helen Keller situation. Nobody has the right to get frustrated with me for something I have no control over. Just like nobody has the right to get frustrated with somebody else about something they have no control over. I’ve done the best I can, and everybody else has too. Getting frustrated with me for not hearing in a piercing black backstage is like getting mad at a man in a wheelchair for not being able to dance with you. I’m not specifically talking to any one person or group of people when I say this, this is a general address. Everybody have a good week, it’s a short one for me!